This wedding set high above a sea cliff overlooking Waipio Valley on the Big Island of Hawaii, was a dream day for Kayli, Matt and their daughter Bella. It was truly a day for ohana (family). As young parents Kayli and Matt believed in eco-friendly practices and wished to make their believes prevalent in their wedding day choices including a planting ceremony, dried confetti bar, serving organic foods and gifting the guests with a live succulent garden. 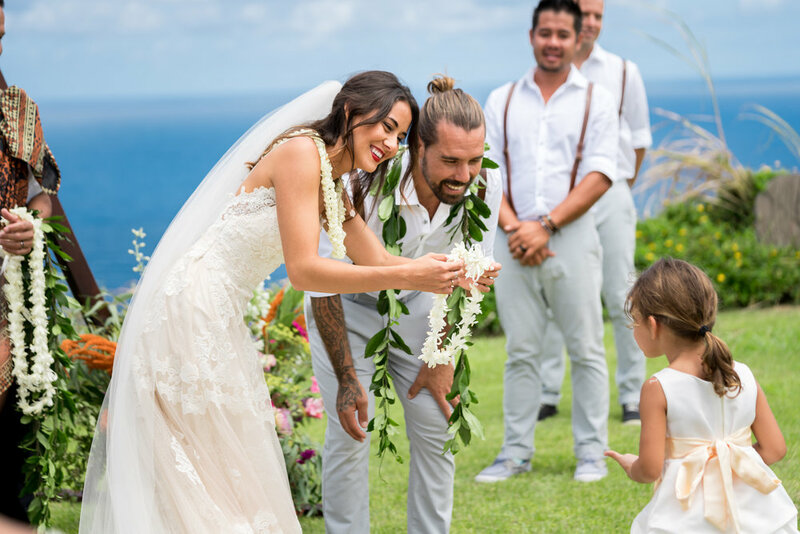 The lovely details and loving moments of their garden party wedding was captured by Waikoloa photographer Ranae Keane-Bamsey of EMotion Galleries and was featured in Pacific Weddings. The Epic Island Coordinators planned and joyful wedding for Kayli and Matt. The couple's environmentally friendly garden party wedding featured all local artisans and vendors. Supporting the local community is the Big Island way.